Slips and trips account for about a third of all reported major injuries, and occur for a number of reasons. The following diagram explains the factors that can contribute to slip accidents and the action to take to prevent them. One or more of these factors may play a part in any slip accident. 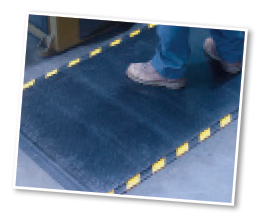 Where a floor is likely to be subject to frequent contamination, people should still be able to walk on it without the risk of slipping, so ensure slip resistant matting is used. Ensure holes, potholes and uneven flooring is repaired and maintained. Use stair treads and anti-slip tapes on stairs which could be slippery. Entrance matting should be used particularly during inclement weather and if dirt or moisture is brought in to other floor surfaces then they should be cleaned immediately. Ensure any raised edges to carpets and matting are rectified quickly to avoid being a trip hazard. It is important to ensure that you use the right type of flooring for your workplace. Obviously this may vary depending on the job done in that particular area, and the safety issues to be considered. Matting, rather than an entire new floor surface is often the best solution, as the size of the mat can be made to fit the area required and with continuing developments in technology, the matting can be made from a range of materials ranging from specialised static dissipative or flame retardant materials through to cushioned anti-fatigue surfaces. The first thing to decide upon is the specific application that it will be used for and the amount of traffic it will have to cope with, whether that’s people walking on it or machinery passing over it, which may also mean that it needs to be able to withstand oil or chemical spillages. 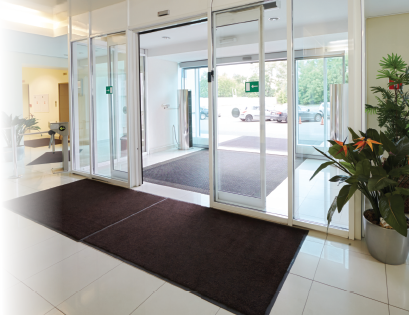 Effective entrance matting can be crucial to maintaining a clean looking environment, 80% of dirt in a workplace can be brought in from foot traffic, so it is useful to have scraper mats or mats with water retentive properties. This will allow the absorption of damp from shoes and reduce the chances of slips. Anti-fatigue matting is an option in areas where people are standing for long periods of time, and can prevent back pain and other ailments. Some mats have textured surfaces which actively encourage very gradual foot movements that keep the blood circulating in the feet and legs and reduce the chances of musculoskeletal pain or varicose veins. Some contain sound deadening properties and so can reduce headaches caused by noise stress. In wet areas such as swimming pools or areas where spillages of liquids can occur, mats which have drainage holes are important, as well as slip resistance. Once all this has been decided, think about the aesthetics and comfort of the product as well as the atmosphere you want to create. ...About The Benefits of Anti-Fatigue Matting? Millions of UK workers spend most of the working day on their feet across many industries. Standing in one spot for long periods of time puts excessive pressure on the feet and can soon escalate into back and leg pain, which is often caused by poor posture. Other common ailments include varicose veins, poor circulation, swelling in the feet and legs, foot pain, joint damage and even heart and circulatory problems. Where it’s impossible to get away from hard concrete or metal surfaces, risk assessments should be undertaken under the Management of Health and Safety at Work Regulations (1999) and anti-fatigue matting could be a potential solution. Most good mats will have bevelled edges to reduce the risk of people tripping over them and will be easy to clean. Many will also offer other additional safety benefits, such as liquid drainage or slip resistance, and can provide thermal insulation or reduce vibrations caused by machinery.